A highly anticipated East Division matchup hits the ice on Saturday afternoon in Brandon as the CHL’s fifth-ranked Wheat Kings (25-9-0-1) host the CHL’s second-ranked Moose Jaw Warriors (28-6-1-2). The second of eight meetings between the two sides this season comes on a big stage as RJ Broadhead, Sam Cosentino and the Sportsnet crew cover all the action. 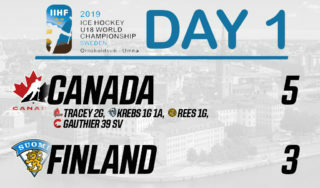 While both clubs have stars away on international duty at the 2018 IIHF World Junior Hockey Championship, stars remain in the respective lineups as the Warriors and Wheat Kings both fight for an edge in the highly competitive East Division. Missing star blueliner Kale Clague who is off with Team Canada, the Wheat Kings will turn to the contributions of Carolina Hurricanes prospect Stelio Mattheos and his team-leading 27 goals. Joining him up front is Colorado Avalanche free agent signee Ty Lewis who leads the team in scoring with 59 points (19-40–59). The Wheat Kings enter action off a home-and-home set they split with the Regina Pats on Wednesday and Thursday. The Moose Jaw Warriors will feature assistant coach Mark O’Leary filling in for Tim Hunter who is off at the World Juniors along with team captain Brett Howden. Moose Jaw has plenty of scoring to spare though with recently signed San Jose Sharks prospect Jayden Halbgewachs and veteran setup man Brayden Burke powering the offence. 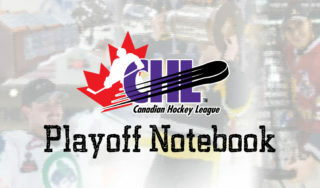 The division leading Warriors enter play off a commanding 8-2 win over the Swift Current Broncos on Thursday. Halgewachs was at his best in that contest, registering two goals and an assist in the lopsided victory. Don’t miss two highly competitive WHL clubs going head to head on Sportsnet. Tune in Saturday afternoon at 3:30pm ET/12:30pm PT. 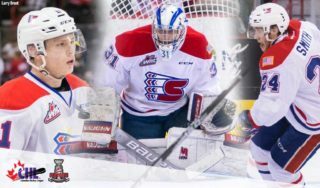 The 100th Mastercard Memorial Cup Tour makes its way to Brandon this weekend. The prestigious trophy paid a visit to CFB Shilo on Friday and will be at Westman Place on Saturday afternoon when the Wheat Kings host the Warriors.